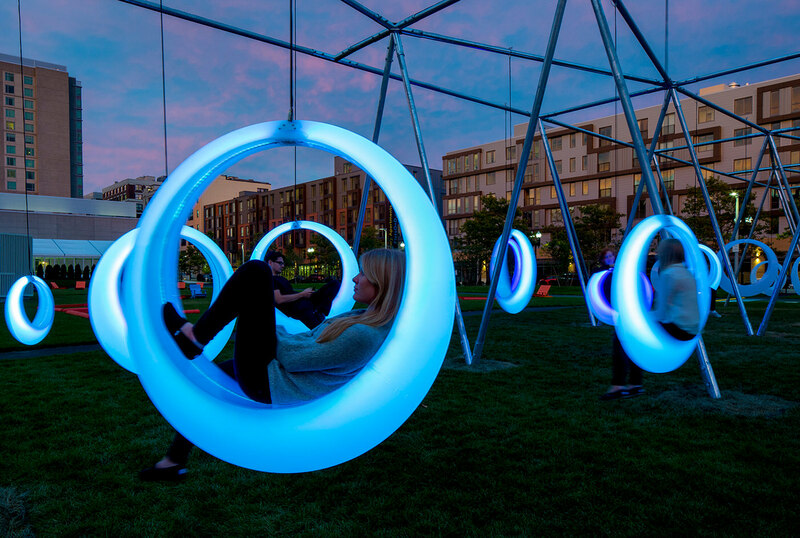 “Swing Time” is an interactive installation on Lawn on D, a park in South Boston. One of Höweler and Yoon's overseas projects is “Sky Courts,” a building in Chengdu, China. On weekend nights in summer, hundreds of Bostonians descend upon “Lawn on D,” a small park on South Boston’s D Street. They can be seen playing board games, enjoying a beer, attending a movie screening, or just relaxing with friends and family. But most of them are waiting for a turn to sit on one of the park’s 20 illuminated ring-shaped swings—the real reason they came here. Far from being monopolized by children, these swings are enjoyed by all ages; friends push each other to go higher, couples share a big swing, young people snap selfies with their smiling faces surrounded by a large illuminated circle. It’s a playground for all. The architects who designed and built the swings, Eric Höweler and Meejin Yoon, M.A.U. ’97, said the overwhelming popularity of their installation “Swing Time” has necessitated some repair work. “The swings have been getting so much love and activity. We are replacing all the rods today to make them stronger,” said Yoon, who jointly runs the firm Höweler + Yoon Architecture with her husband. Yoon chairs the architecture department at MIT, and Höweler teaches architecture at the Harvard Graduate School of Design. A fresh breath of fun and novelty in the often austere urban landscape, the swings are equipped with LED lighting which signals their activity level—the higher one soars, the bluer the swings become. When the Massachusetts Convention Center Authority decided to launch its expansion of the exhibition center with a small, experimental outdoor event space on D street, called “Lawn on D,” that would feature arts, music, games, and food, Höweler and Yoon proposed a number of amenities to brighten up the park, including seesaws and merry-go-rounds, but finally settled on oversized swings, which strike just the right balance between safety and fun. So many people showed up on the opening night that the couple could not get a seat themselves. Everyone has memories of swinging from childhood, but few adults have swung recently, Höweler explained. When a large crowd gathers for a fun activity in a public space, it creates a sort of anonymity that allows people to let loose and be less self-conscious. The nature of swings also encourages social interaction—some people may need to be pushed by others, and two people can share a large swing. 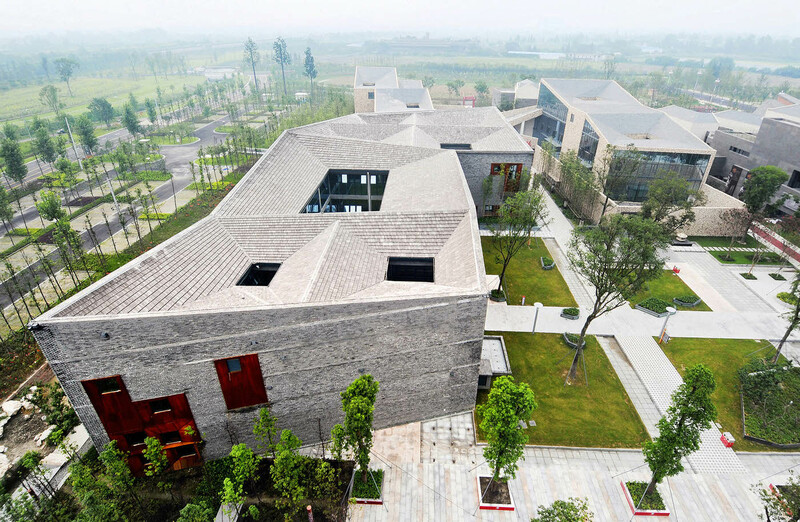 This is an example of how architectural designs can alter the dynamics of how people interact and behave, he said. The installation was first unveiled last fall for a test run. In its original version, each swing was suspended with a cable, which tended to spin as people swung, wearing down the electric cables that supplied power for the LED lighting in the seats. An improved version installed this May replaced the cables with more durable rods, and switched the energy source—to solar power. Above the swings hangs a row of south-facing solar panels, which absorb energy during the day to power the lights at night (7:30 p.m. to 10:30 p.m.). In theory, this off-the-grid swing set can now be moved anywhere. To the disappointment of the park’s many devotees, the swings will be taken down permanently in October, their materials recycled. The park was from the beginning meant to be temporary, and may need to make way for the expanding convention center in the future. Höweler and Yoon have been asked to rebuild the installation in Florida, Australia, Singapore, and France—by governments, designers, park conservancies, event planners, even a family who wanted to buy a single swing for their backyard. But the couple decided not to repeat themselves. They are architects looking to build diverse projects, not swing set vendors, Höweler explained. However, by lighting up the neighborhood, both figuratively and literally, the swing set is expected to leave a legacy of its own. “A few years ago it was hard to imagine buying an apartment in that neighborhood because it seemed so remote and there’s nothing around it,” Höweler observed. “But if you feel like there’s a park and a public life, then it would be… viable.” Building public spaces before private residential buildings is a far-sighted move, because it increases the value of nearby properties by changing people’s impression of the neighborhood, he said. “Swing Time” is only one of the couple’s many architectural projects in Boston and around the world. 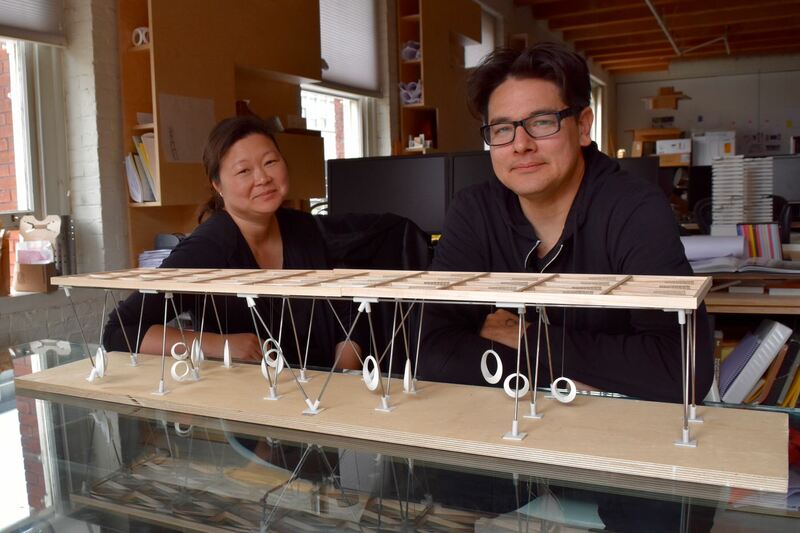 They are currently working on the fabrication of “Crisscross Signal Spire”—a 40-foot-tall bundle-like sculpture made of perforated pipes that will be erected at Roxbury’s Dudley Square in July. Like many projects they have built, the spire’s elegant and simple look belies the sophisticated technologies used in its construction. The City of Boston created a smartphone App called “Citizens Connect” which allows residents to alert city officials to neighborhood issues such as potholes, damaged signs, and graffiti. 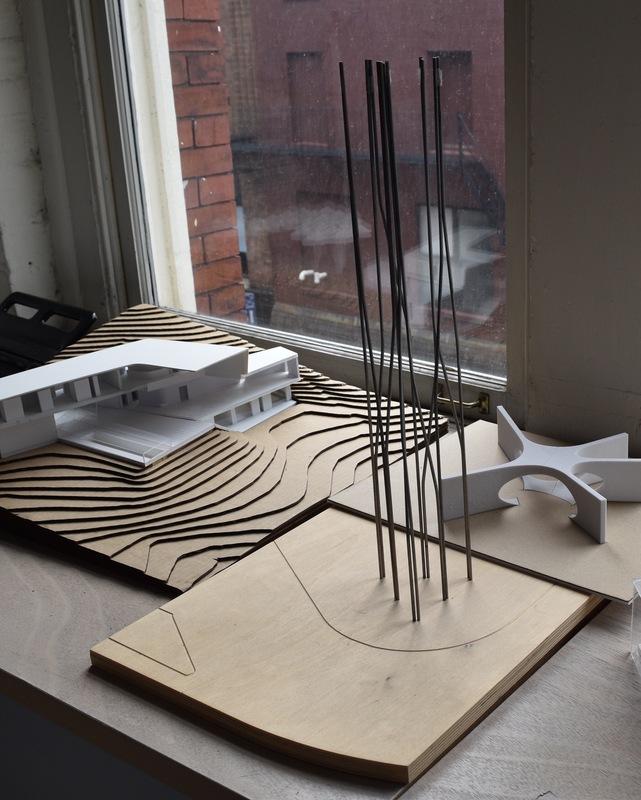 The lighting behavior of the new sculpture will be a real-time, three-dimensional visualization of the interactions between the citizens and the government, made possible through the data obtained from Citizens Connect. 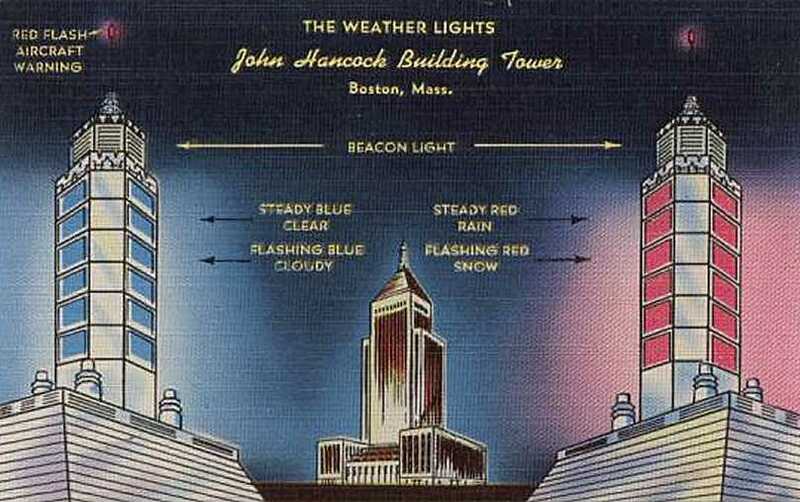 Each node on the pipes corresponds to a neighborhood, and different types of requests are coded as different colors of lighting. Nowadays, people expect more smart technologies in their city’s public spaces, such as Wi-Fi in parks, he said. Boston is doing “surprisingly well” in integrating such innovative features into its urban landscape. Some park benches in the city are even equipped with solar-powered charging stations. To Höweler, creating projects in the public realm is especially exciting because architecture is often associated with private spaces. “Our point is that the public realm needs to be conceived. It cannot be an afterthought; it cannot be a residue,” he said. The same thinking applies to university campuses. While much of MIT’s campus is linked through an “infinite corridor,” allowing students and faculty across departments to meet without leaving the building, Harvard’s widely dispersed individual schools can feel disconnected, and extra efforts need to be made for inter-school collaborations to take place. Since the beginning of the Harvard Common Spaces program in 2009, more gathering spaces, such as the Science Center Plaza, have been created throughout the campus to foster a sense of community. Höweler noted that the simple decision to put colorful chairs on the lawns in Harvard Yard has helped the school cohere by attracting people, and encouraging them to linger and interact there. Yoon and Höweler first met when they were studying architecture at Cornell in the early 1990s. Architecture is one of the professions where husband-and-wife collaborations are fairly common, as colleagues become partners in work and in life. The couple said that it is a challenge to balance their full-time teaching commitment with the 25 architectural projects they are currently working on, while at the same time taking care of their 4-year-old daughter.